Verizon, Motorola, and Adobe have announced they will be introducing the next generation of Droid mobile devices on Wednesday, June 23. The Droid launch comes just one day before Apple officially launches iPhone 4 , the next-generation of Cupertino's super-popular smartphone. Adobe will be on hand at the Droid launch on June 23 presumably to tout the virtues of the much ballyhooed Flash Player 10.1 for mobile devices that is compatible with Android 2.2, Palm WebOS, and Symbian S60 systems. Rumors are already circulating about what the new Droid will look like, and right now there are two different device rumors circulating online. Gadget blog Engadget says it got its hands on an impressive new device called the Droid X that looks like it can stand almost toe-to-toe with Apple's iPhone 4 . Meanwhile a lesser known Droid-centric blog called DroidLife recently posted photos of of what it calls the Droid 2, which simply boasts some minor tweaks to Motorola's original Droid device. Engadget has an extensive first look including at what the it claims is the Motorola Droid X, including several short videos showing the device in action. The device is similar to the so-called Droid Shadow that was found in a corporate Verizon gym in May and subsequently leaked to Gizmodo. Engadget says the Droid X has a large 4.4-inch screen with 854 x 480 resolution, and an 8 megapixel camera with flash and the ability to record 720p high definition video. In the videos, the new device appeared to be very responsive and Engadget posits that it is powered by a 1-GHz processor. The rumored Droid X has an HDMI out port, 4 physical buttons along the bottom of the device, a capacitive touchscreen, and 8GB of internal storage. Apparently, the Droid X is running Android 2.1 (Eclair) , and not the newer version of Android 2.2 (Froyo) . One reason it may be running Eclair is because the Droid X appeared to be running a newer version of Motrola's Motoblur overlay. In the past, Motoblur has been known to delay OS updates for other Android devices such as the original Motorola Cliq . But if Engadget's Droid X is the real thing, and if--as expected--Flash 10.1 will be part of the Droid X, the operating system is likely to change by launch time or shortly thereafter. The reason is that you need Android 2.2 to run Flash 10.1 for mobile devices, according to Adobe. Unlike HTC's EVO 4G and Apple's iPhone 4 , the new Droid doesn't appear to include a front-facing camera. The major differences between the Shadow and this newer Droid X is the screen is slightly larger--4.4-inches instead of 4.3--and the internal storage in the X is only 8GB, while Gizmodo reported in May that the Shadow had 16GB of storage. There are no details so far on launch date or pricing, but that should become clearer next week. Another device rumored to be in the mix for next Wednesday's Droid announcement is a device called Droid 2 . 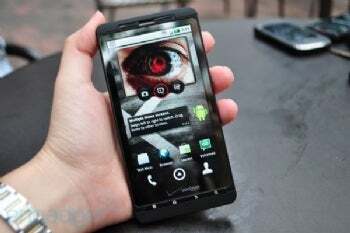 Uncovered earlier this month by a Droid-centric blog called DroidLife , the Droid 2 is basically the same as the current version of the Droid but with several minor updates including a faster processor, Android 2.1 operating system, and a new keyboard. While the Droid 2 doesn't sound that exciting, the Droid X has the potential to make smartphone choices really interesting over the next few months. It sounds like it could actually compete with new devices like Apple's iPhone 4 and HTC's Android-based EVO 4G .